Of the NES games experienced, and despite prejudices towards other games (which were not necessarily based on any specific objective reasons), I would have to give “best overall game” honours to Castlevania. Which was a surprise as, for whatever reason, I hadn’t given it any specific attention in the lead up the this retro gaming project. 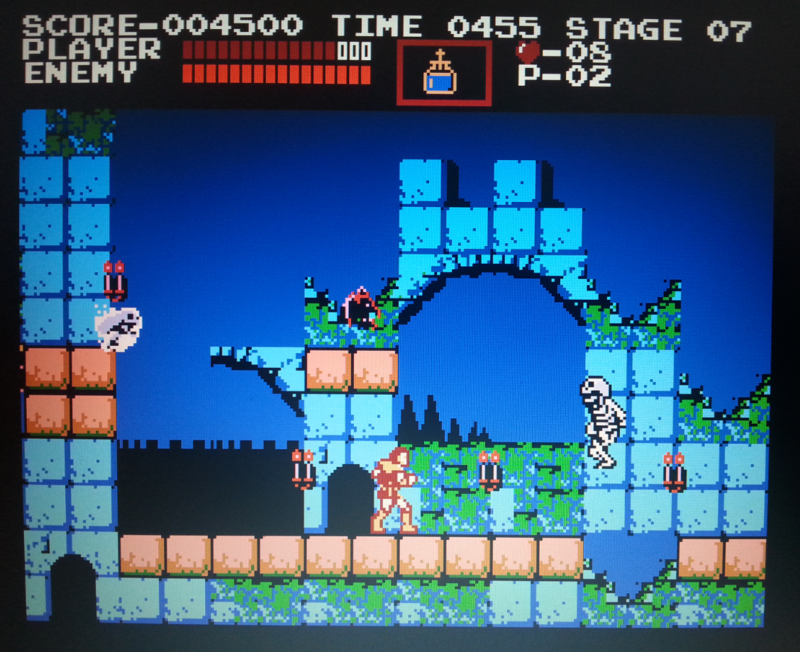 Castlevania implements essentially all the similar mechanics as Super Mario Bros; in particular the dreaded count down time and lack of game saves, Metroid and Mega Man, but creates a much more immersive aesthetic by implementing these mechanics in a very neatly laid out and visually attractive “Castlevania World”. The effort put into the design of the world and the graphics is obvious and creates an equal (if not better) level of impressiveness as Mega Man. Similar to Metroid, Castlevania creates a world that feels more integrated and purposeful than Mega Man – but here Castelvania outclasses Metroid. 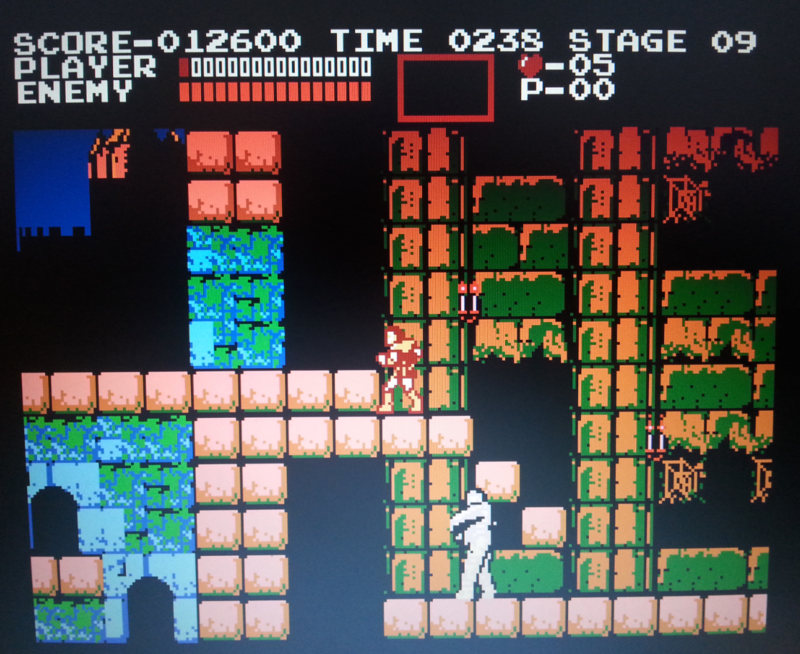 Instead of just ascending Metroid’s non-descript “shafts”, in Castlevania you venture up and down through the Castle and its surrounding architecture. I guess Castlevania has the advantage of being able to base its world design on something relatively familiar to the gamer, as opposed to the fictitious Planet Zebes. Be this the case, it is a well designed world. More serious and less “fun and quirky” than Mega Man, but very effectively delivers to the core theme of the game. 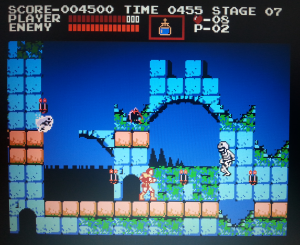 Like Metroid, Castelvania has several different enemy types, individually easy to defeat, but challenging to deal with when used in combination and/or with a particularly challenging level design. Unfortunately I only had time to work my way through the first two bosses…and both were unique and fun challenges. Castlevania probably introduced a much broader set of pickups and weapons, and combined this with the need to collect hearts which would alter the amount of usage available to the gamer. But after playing for awhile I didn’t really feel too compelled to chase down pickups, many because some of them didn’t feel very well implemented (or which I was just unable to use properly). The Firebomb potion was an example of a weapon that never seemed to work as hoped… So I tended to just whip my way forward. Castlevania also offered plenty of “hidden” pickups, usually gained by whipping at the brickwork in the hopes of revealing something (a’la Super Mario Bros). Unlike Metroid and Mega Man, I never really felt the need to farm or any other simple dynamic behaviours. So,unfortunately, Castlevania becomes another victim of my limited time. But I really enjoyed the game, and was happy to end my NES experience on this well put together game. 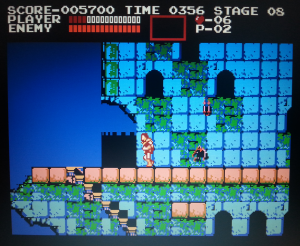 As a hobbyist game designer, if I ever decide to head into designing a platformer, I think Castelvania will be definitely something to use as the basis. I have been playing this a fair bit recently, and haven’t managed to finish it yet. Incredible game, with a brutal difficulty curve. Aesthetic wise though, I’ve always thought the 2nd Castlevania game was much more pleasing to look at, although for a linear action thrill, you can’t beat this one! Good write up! Cheers Adam…I’m hoping to get back into the retro project soon – been onhold for awhile.